PBS has aired disturbing footage of the beating and killing of Anastacio Hernandez Rojas. 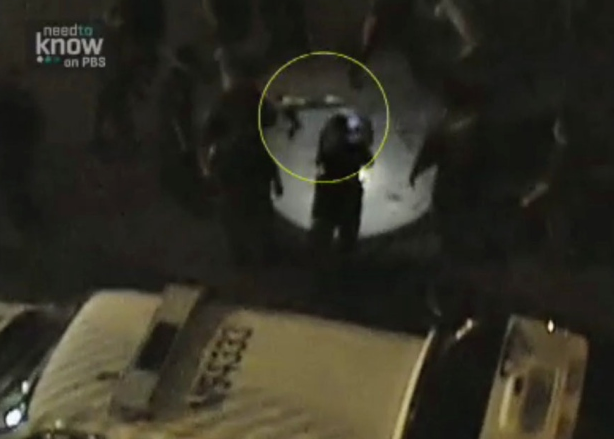 Agents claim Rojas was resisting arrest but the new footage should Rojas had his legs and arms bound. The incident happened in 2010, but this new footage raises new questions. Disturbing new footage, aired on PBS, appearing to show federal agents beating and Tasering a handcuffed illegal immigrant hours before his death sheds new light on a case that has drawn scrutiny on the U.S. border patrol. The case of Anastacio Hernandez Rojas gained national media attention in 2010 after he died following a confrontation with border patrol agents who were trying to deport him. Rojas, 42, and his brother were caught on May 28 sneaking from Mexico into San Diego, where he lived for more than a decade. Rojas' family said the new videos support their claim that the agents used excessive force on him during the arrest. The videos were aired in a PBS report called “Need to Know” on Friday. One clip appeared to show nearly a dozen agents hitting Rojas, then repeatedly shocking him with a stun gun as he lay handcuffed on the ground at a border crossing in San Ysidro, in San Diego County. Seattle resident Ashley Young, who said she shot the video from a nearby footbridge, told PBS she didn't see Rojas resisting and felt like she was watching "someone be murdered." A second video, shot by another witness, captured Rojas pleading for his life and shouting for help in Spanish, the PBS report said. Rojas eventually stopped breathing, and died later at a hospital. The San Diego medical examiner later ruled the death a homicide and the San Diego police investigated the incident. But no agents were charged after the U.S. attorney overseeing the case said the coroner found methamphetamine in Rojas' system and charged that the father of five had become violent and fought with the agents while in custody. Rojas' family filed a wrongful death lawsuit against the U.S. government and 12 federal agents, claiming Rojas was beaten, shocked, then left to die. "It has been two years since Anastacio was killed, and the medical examiner ruled it a homicide, and we are still fighting to get simple discovery," the family's attorney Eugene Iredale told Reuters. "They applied 3,000 volts of electricity over and over to a helpless, handcuffed man and left him hogtied until he was brain-dead," he said. U.S. Customs and Border Protection declined an interview with PBS, citing an ongoing investigation, but released a statement saying the agency "stresses honor and integrity in every aspect of our mission. "We do not tolerate abuse within our ranks, and we fully cooperate with any criminal or administrative investigations of alleged misconduct by any of our personnel, on or off duty," the statement said.